My wife Mxxxxx and I just got back from a nice little vacation in Georgia, where we went for a family reunion of sorts, and over the course of the trip two very significant UFO happenings happened. Well, three things, if I count the fact that my wife's uncle Cxxxxxx turned out to be very interested in UFOs, which led to some fun conversations at the party. On our way out through Chattanooga, TN, we spotted an antique mall and pulled off the interstate to check it out. It was a pretty huge place, so when we got inside we kissed each other goodbye and went off on our separate ways. While my wife loves to look for antique kitchenware, I gravitate to vintage toys. I'm happy to say the place was full of old toys. I'm sorry to say very few of them were of any interest or value, so I returned to the front of the mall to see if I could find my wife. 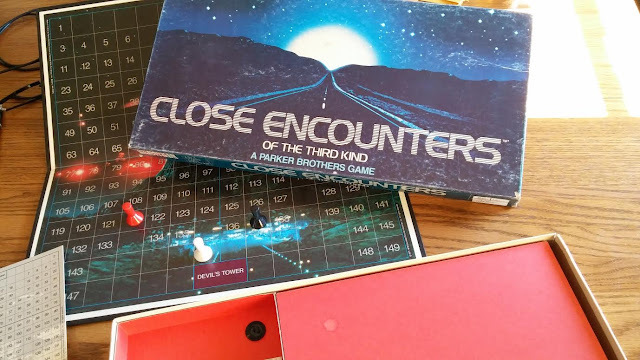 That's right: the geniuses at Parker Brothers made "Close Encounters of the Third Kind" into a board game! And there it was in the display case right in front of me, in a random antique mall outside Chattanooga, TN, -- a place I would, most likely, never set foot in again -- on sale for the ridiculously low price of $10.00! What could I do? I had to have it! As soon as I had the chance I opened the game to see how it was played, planning to challenge my wife to a game at the earliest opportunity. I don't mind saying, my expectations were pretty high; Parker Brothers have created Monopoly, Clue, Sorry, Risk, Aggravation and countless other classics; surely "Close Encounters of the Third Kind" would rise to the same level. "Imagine this: First you see some spaceships. Then your mind becomes possessed: you see visions of Devil's Tower in Wyoming; you hear a weird, mysterious 5-note melody; you travel to Devil's Tower with the hope of boarding the Mother Ship and flying from earth with its crew. You arrive at Devil's Tower only to discover that others have come for the same purpose. You learn that only one of you will be allowed to board. To board the Mother Ship, you must compete against the others in a game, and win." Okay... that's not exactly how the movie played out, but I get it: they were trying to make a game out of a very non-game-like narrative, so they had to take some liberties. But then I read further into the instructions and found that they really, really loused it up... The point of the game is to get onto the Mother Ship, right? But to actually play the game, you start at Devil's Tower, then journey to the Mother Ship, then back to Devil's Tower, then back to the Mother Ship, ad infinitum, until you "'sound' all five notes of the mystery tune by placing each of your five chips on the board."... or go completely insane from boredom. Because the way the rules are written, it could take years to place even one "chip" on the board, much less five. It's like playing Battleship on an ocean gameboard the size of the actual ocean. Really, I was ready to cut the game designers a little slack, but they designed a game that is not only completely boring and drama-free, but pointless, brainless and virtually unwinnable, all while having absolutely nothing to do with the actual movie on which it is supposedly based. You never actually hear the crucial five notes, and then the aliens don't even show up, for Christ's sake! My God, it's stupid. What makes it even worse is this: Columbia Pictures was obviously licensing the hell out of this movie when it came out in 1977, but do you think Dr. J. Allen Hynek, who coined the "Close Encounters" terminology, earned one single penny off of this game?